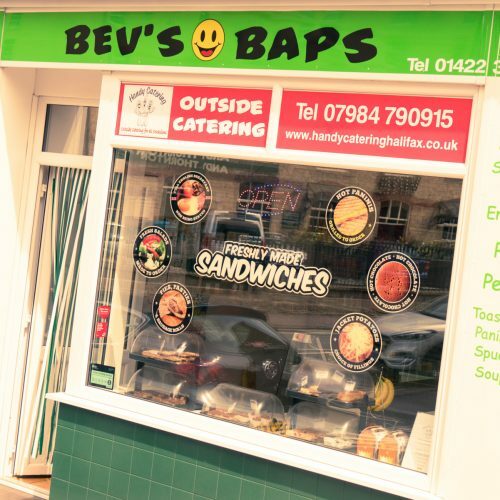 Welcome to Bev’s Baps, Halifax. Our team aim to deliver delicious, fresh food to all of our customers – complete with daily specials. We offer a fast and friendly service, with quality hot and cold snacks on offer. We are always happy to help, and if there is anything you do not see on our menu then please do not hesitate to ask. All of our sandwiches are freshly made to order, so if you require anything made to your personal tastes, please ask. Any combination of sandwich can be made on either white, brown or currant teacake. We also have fresh bread, cream cakes and various other buns, cakes, crisps and chocolates. And if you though it couldn’t get better – you call we deliver! (With free delivery on orders over £15).